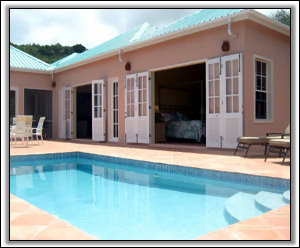 Nevis Villa Rentals - Island Time Villa - Great views of St. Kitts and the Caribbean sea. The spectacular Island Time in Nevis is a private villa designed in the traditional West Indian style, now available as an exclusive rental villa. Island Time has a terrace level pool, beautiful landscaped gardens, and 4 spacious bedroom suites. With wide unobstructed views of the tropical blue Caribbean Sea, you’ll watch the sun set across the west beaches of Nevis to St. Kitts. The neighboring protected palm forests of Tower Hill Estate and Nevis Peak rise to the north and east. And because of its hillside location, the house is cooled in all four seasons by Caribbean breezes. Island Time is your own private paradise. Island Time is situated in the secluded region of Upper Jessups, Fern Hill III. At 850’ elevation, it is one of the highest houses in Nevis. Walking trails through the tropical vegetation to Nevis’ rain forest begin outside your door. A short drive from the villa meanders through the world class Four Seasons golf course and local villages, bringing you to unspoiled beaches, wonderful restaurants, luxurious spas, resorts, shopping districts, a botanical garden, numerous historic sites, museums, organized hiking expeditions, deep-sea fishing, water sports and biking – and MORE BEACHES. All within a 10 to 15 minute drive from your doorstep. The airport is 15 minutes away. 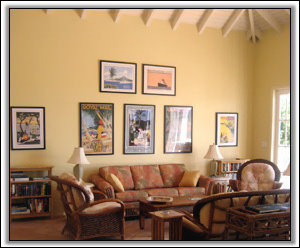 Island Time Villa offers wide open views of the Caribbean Sea, right from your easy chair in the Great Room! 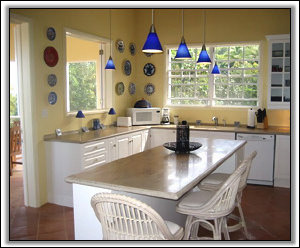 Warm Mexican Saltillo Tiles and high ceilings throughout the Villa reflect traditional plantation-style details. The kitchen shows off the owners’ collection of European and Middle Eastern plates set the stage for preparing wonderful meals. All the kitchen equipment you need, including the ever-important ice maker and blender. Caribbean cookbooks help stimulate your culinary imagination. Located off the Sunset Terrace, and connected to the Kitchen is the screened Dining Pavilion that seats up to 8, with a cozy, private seating area for two with wicker rockers. 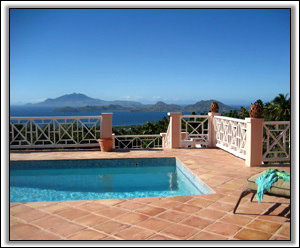 Views surround you, west to the sea, north to the neighboring conservation land, and east to Nevis Peak. This a great place to sit with a cup of coffee and watch the sun rise over Nevis Peak, and later, with a rum punch, watch the sun set. Island Time has 1,000 sq. feet of terraces and verandahs. 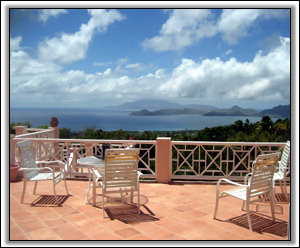 The Sunset Terrace is open to the fantastic views across the western beaches of Nevis to the Caribbean Sea and nearby St. Kitts. Soft lighting on the terrace at night creates a magical ambiance for late night conversations in the warm Caribbean evening climate. 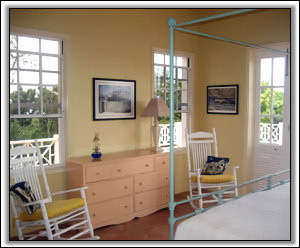 The East Verandah is a large screened porch with views to Nevis Peak, furnished with comfortable chairs and side tables. The Garden Terrace, on the lower level, is accessible by staircase from the Sunset Terrace. Surrounded by mangoes, passion flower vines, heliconia, and other tropical blossoms, it serves as a secret garden and private terrace for the Tropical Garden Suite. Bougainvillea Suite: Main floor master bedroom with king-sized bed, ensuite bathroom, private ocean view terrace with direct access to the adjoining Sunset Terrace and swimming pool. Frangipani Suite: Main floor guest bedroom with twin beds (can be turned into one king sized bed), ensuite bathroom with shower and Jacuzzi. 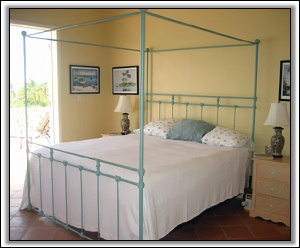 Star Jasmine Room: Main floor guest bedroom with twin daybeds, flat screen TV. This room can also serve as a separate sitting/reading room when it’s not occupied as a bedroom. Tropical Garden Suite: This master bedroom is located off the garden in the lower level, with queen-sized bed, ensuite bathroom, private entrance with ocean views, your own terrace and flower garden. Watch Nevis’ shy Vervet monkeys cavort in the nearby trees. Island Time Services: Island Time is managed by Sugar Mill Real Estate, whose experience and services will make your time in Nevis easy and fun. Included in your rental of Island Time are these services: Meet and Greet services at the airport or ferry, and an orientation of the property; rental car arrangements; restaurant, tour and activity reservations; Welcome Basket of beverages and breakfast provisions; maid service for one or more days during your stay; arrangements for cribs, high chairs, and additional baby items upon request (there may be a nominal fee depending on items needed and length of time); gardener and pool services; 24-hour emergency contact. 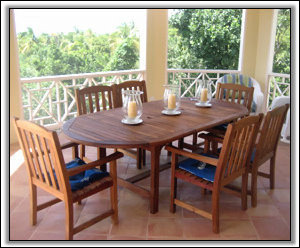 For additional fees, we can provision your villa for your stay, or arrange for a private chef.